ClearLungs is a unique blend of Chinese herbs that helps maintain free breathing, keep airways open and mucus levels normal. It is the natural alternative for those suffering from bronchial congestion. Respiratory conditions can be caused by many conditions such as pollution and pollen, smoking, and bacterial or viral infections. ClearLungs is based on a traditional Chinese formula that has been used for many years, and has been the #1 natural lung health product in the United States since at least 1998. Every minute of every day, awake or asleep, our lungs quietly do their job. On a typical day, they draw in, filter, heat, moisturize, and process about 38 lbs of air. That is enough to fill an 8x8x8 foot room! The lungs extract life-giving oxygen and expel water, carbon dioxide, and metabolic wastes, and during stress or exercise, they process much more. Keeping lungs healthy and airways clear is a priority for people with respiratory challenges. These may include obstructive conditions (like asthma) which reduce airflow, or restrictive ones (like pneumonia) that reduce lung capacity. They may also include factors like pollution, allergies, dust, high altitudes, and athletic training. Carrying a few extra pounds around the middle can also affect how well your lungs work. You can keep your lungs in top condition. Learn how to deep breathe, get enough rest, exercise regularly, avoiding allergens and arid, dusty environments. All of these things can all help your lungs do their job well. 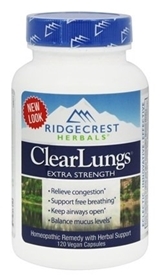 Ridge Crest Herbals ClearLungs, X-tra Strength can definitely help support lung health to smokers, and other people with respiratory issues.